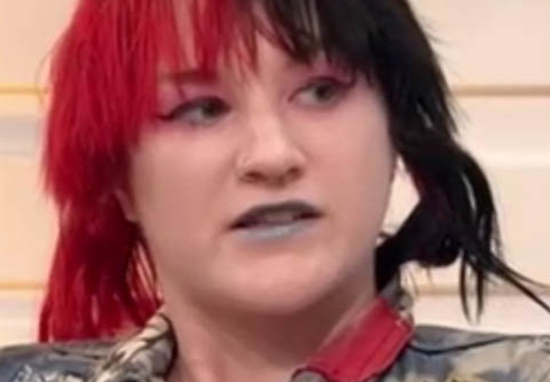 When gender fluid Tabitha appeared on Good Morning Britain, she faced the wrath of hot-headed interviewer Piers Morgan. 21-year-old Tabitha identifies as gender fluid, which means her gender identity can shift between male and female from one day to the next. 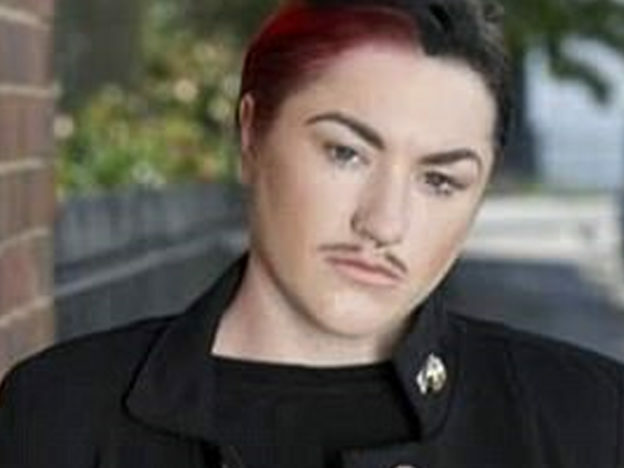 Tabitha – who was born female – spends some days as Tabitha, where she dresses as a woman and dates a man, and other days as Tate, where he dresses as a man and has a relationship with a woman. 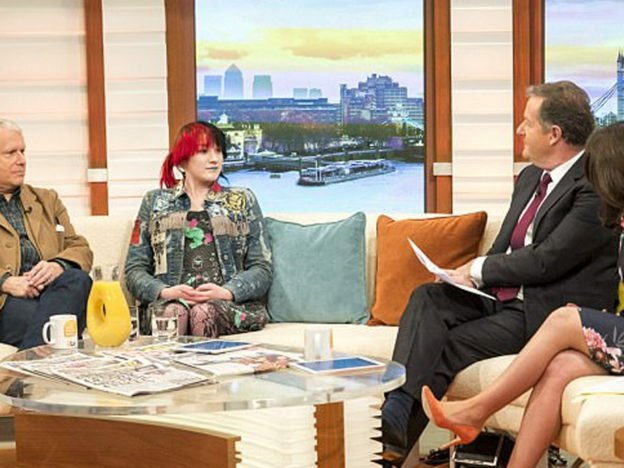 On the day of the Good Morning Britain interview, Tabitha was feeling to be a woman. However she explained she never knows what gender she will be until she wakes up in the morning, admitting it can be confusing. There’s no percentage at all – you just get what you’re given on the day. Piers appeared to be genuinely baffled after asking personal details about Tabitha/Tate’s public toilet habits and did not take too kindly to this at all. You can’t be male or female… why should you have the freedom and I don’t? That is the difficult thing about being trans… Sorry, gender fluid. The reason I said trans is because I have many trans friends. Of course, being gender fluid and being trans are two very different things. A trans person is an individual whose gender identity does not fit with the one they were assigned at birth. A gender fluid person such as Tabitha may be much more flexible with how they regard their gender identity. 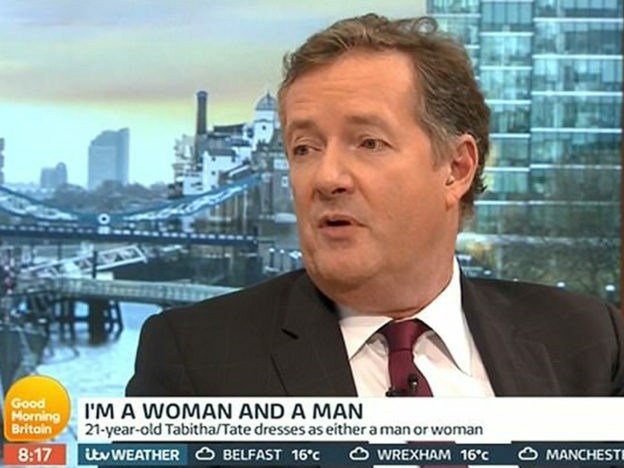 Piers suggested Tabitha’s ‘confusion’ regarding gender could stem from her biological father transitioning to become a woman, who is now known as her mother, Petra. This mention of family history appeared to make Tabitha look visibly uncomfortable. I’m not confused about being male and female, it just takes a couple of minutes to work out. My problem with this is you can’t be male or female. You’re born one or the other. If you want to have an operation fine, I just don’t get this gender fluid stuff. If you can identify as who the hell you like, can I literally look at myself and say – and I’ve made this joke before – I’m an elephant today. Why should you have the freedom and I don’t? Where does this go? Tabitha confirmed she would have no issue with Piers identifying as an elephant. She looked extremely uncomfortable talking about it and think it was a very sensitive and upsetting subject re her father/mother. What's everyone's problem? Who is she hurting? Please be whoever you want to be but give a solid answer to a question. I fully support transgender rights. I don’t support ‘gender-fluid’ bulls**t.